With Chrome 71 that will be released in December 2018, Chrome will show a warning sign about the insufficient mobile subscription information pages, so that users can make informed decisions when signing up to mobile-based subscription services. Users will be offered the choice to proceed to the page or go back if they were unaware that they were entering a billing page. Google says that it wants to make sure Chrome users understand when they are going through a billing flow and trust that they’ll be able to make informed decisions while browsing the web. To adequately inform users, it’s important to provide a sufficient level of details within the billing page as outlined by the new mobile billing charges. 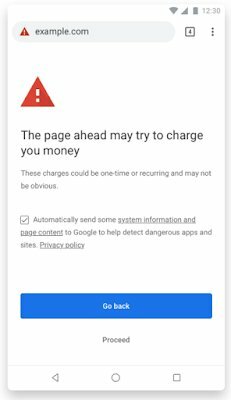 If Chrome detects pages that don’t provide sufficient billing information to users, it will display a warning sign to the user on Chrome mobile, Chrome desktop, and Android’s WebView. When Google identifies such pages, it will notify the webmaster through Search Console where there will be an option to let it know about the changes they’ve made to clarify the billing process. Google won’t make any changes if websites offer clear information about the billing process.